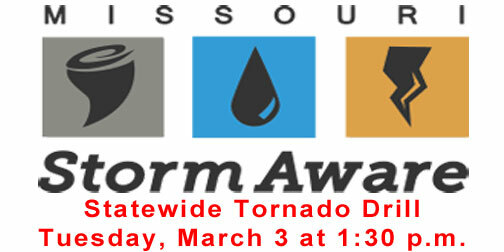 On March 3, outdoor warning sirens and weather alert radios across the state will sound, signaling the beginning of the statewide tornado drill and indicating that Missourians should practice taking shelter. The safest shelter location is the basement or an interior room in the lowest level of a building. Other safe locations for businesses and schools include interior stairways and tornado safe rooms. The drill can be completed in as little as 15 minutes. 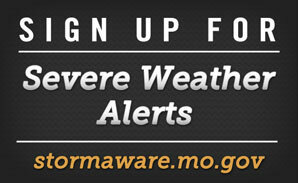 More information can be found on Missouri's www.Stormaware.mo.gov website, which includes detailed videos and other useful resources about tornado sirens, flash flooding and weather alert radios. The site also includes links to free severe weather texting services that can alert people across Missouri to upcoming severe weather.